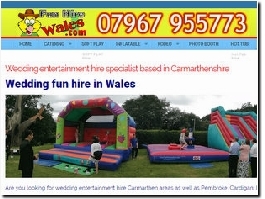 We offer a quality wedding catering and inflatable fun hire service across Wales and areas of England. We Carry a 5-star food hygiene rating as well as being fully insured. We also offer giant games to keep wedding guests entertained and Rodeo Bull hire! We specialise in bouncy castle and inflatable hire. Our number one priority is helping you to create some amazing memories on your special day. We pride ourselves on first class customer service, reliability and of course fantastic castles. 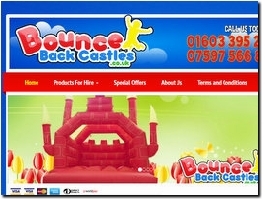 Bounce Back Castles Ltd provide a range of hire services all over Norfolk and Suffolk. As well as standard children's bouncy castles we also have lots more! We are a family run business based in Runcorn Cheshire. We deliver quality themed bouncy castles to surrounding areas such as Warrington, Widnes, Frodsham, Northwich, Ellesmere Port and Chester. Garden Games Partyhire specialise in giant games, side stall games, inflatable games and bouncy castles for Weddings, Parties and events. We specialise in bouncy castle hire for wedding events in Liverpool so if you are looking to hire a bouncy castle for your wedding, let us know as we can take care of all your needs. Here at It's Funtime we specialise in high quality soft play hire and bouncy castle hire including our amazing all white wedding bouncy castle. What could be better to entertain your younger guests on your big day? PJ LEISURE have been in the inflatable & bouncy castle hire business for almost 22 years with a excellent five star google review we are Manchester premier bouncy castle hire company. NO1 Company For Bouncy Castle Hire Kids/Children's Party Entertainment , Hot Tub Hire & Soft Play Hire in Newcastle, Hexham, Morpeth, Blyth, Ashington, Bedlington, Berwick, Ponteland, Consett, Stanley, Durham And Beyond. Choose Prestige Leisure for your wedding. We supply the best in ice cream tricycle hire, funfair rides and side stall hire, inflatables and bouncy castle hire, mini golf hire, catering and more. Bouncy castle hire Birmingham and surrounding areas, offering a wide range of spectacular bouncy castles with vibrant stand out colours and themes for all ages and genders. Bouncy castles in various sizes & themes, inflatable games, soft play & garden games all available for hire in East Sussex including Bexhill, Eastbourne, Hailsham, Hastings & Rye. Free local delivery, set up & collection. Experienced & friendly service. One Stop Castles have a great selection of bouncy castles for hire in different sizes, for indoors and outdoors, for all budgets and to suit all ages. 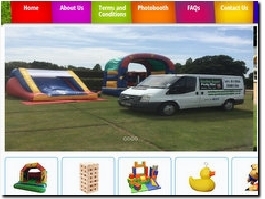 Gedling Bouncy Castle Hire offers Adult and Children's Bouncy Castle Hire, Inflatable Slide Hire, Fun Food Hire, Soft Play and Ball Pool Hire. Some of our equipment is Bouncy Castles with Slides, Soft Play, Ball Pools, Garden Slides and Event Slides. Crown Castles is a bouncy castle hire company based in Huntingdon, Cambridgeshire, with adult castles children's castles, disco dome, popcorn maker, slush machine and more. Fully Insured! We have been supplying bouncy castles and inflatables to Birmingham and Solihull for many years, so if you would like to hire clean, safe equipment give us a call or visit or website, once there you can even book online. East Coast Castles bouncy castle and inflatable hire. East coast Castles bouncy castle and inflatable hire Based in Bangor Co Down. With loads to choose from check out our website where you can book everything online or find us on Facebook. We look forward to hear from you. Bouncy Castle and Inflatable Hire, Assault Course, Inflatable Games, Soft Play Hire, Sweet Cones, Sweet Cart Hire, Mascot Hire and more! For a genuine and professional service please get in touch and let us add the wow factor to your special day! Here at jungle jacks castles we hire bouncy castles around the manchester area including wythenshawe and stockport book now to avoid disappointment we have a huge range of bouncy castles to choose from. Jelly Fish Entertainments provides inflatable equipment for hire across the Midlands. Areas that we cover include: Leicester, Nottingham, Derby, Coventry, Northampton and Warwickshire. 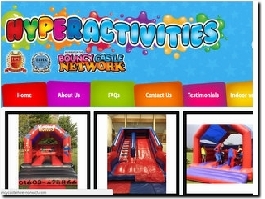 Bouncy Castle and Soft Play Hire around Newcastle upon Tyne and surrounding Areas. We provide Bouncy Castles, Candy Carts, Soft Play and other great fun wedding extras. All provided by fun and friendly staff and ready to entertain your guests. Bounce Party specializes in the hire of slides, disco domes, obstacle courses and bouncy castle in counties Louth, Monaghan and Armagh. 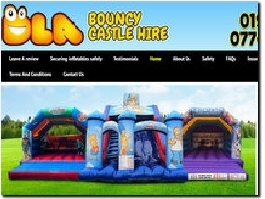 We provide high quality bouncy castle and inflatable hire in Belfast, Dundonald, Bangor and surrounding areas. With an extensive range of inflatables to choose from with something for everyone!